Hey big laundry detergent companies...the jig is up! You have been fooling us for too long! Turns out we don't need to cough up a bunch of cash for those expensive, chemical ridden detergents anymore. 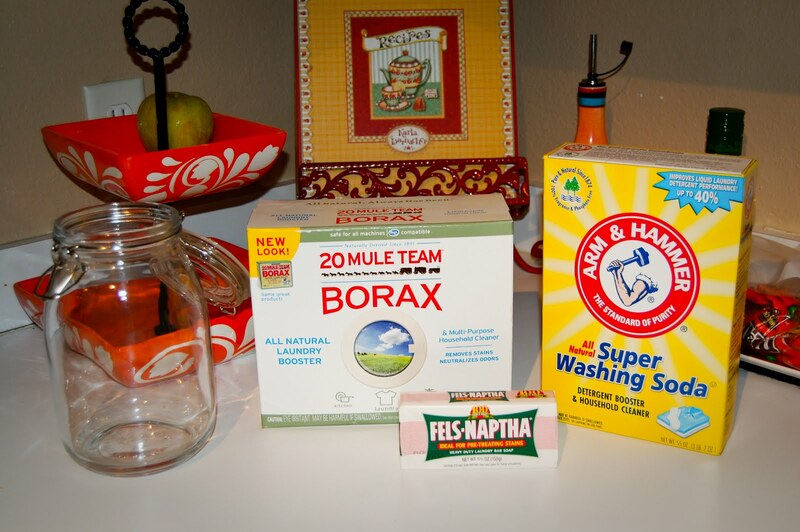 If you've been on any blogs lately, chances are you've seen people making their own laundry detergent. And it really is as easy as everyone is claiming it is. I got all 3 ingredients at Kroger for less than $3 each. Ok, I'm not going to pretend for a second that I came up with this recipe or that it was my idea. I did a lot of research and found many, MANY different sites, mixtures, recipes, ingredients, and so on. Here are some of the links I used to make my concoction. First I grated the bar of Fels-Naptha. Next time I do this, I'm going to try Dr. Bronner's. This was the most irritating part of the process but it only took about 15 minutes...nothing that would keep me from doing this again. It wasn't quite powdery enough so I threw it in my lil' food processer and got it to the consistency I wanted. Might even grate it even more next time. Mix all the ingredients together...and that's it! Use 1tbsp per load. And YES you can use it with HE machines because it's a low suds detergent. If you don't want to use fabric softener anymore, you can just put a couple drops of oil (like lavender or Tea Tree) on a washcloth & throw it in the dryer with your wet clothes. To soften your clothes, put a little vinegar in the "softener dispenser". Turns out it removes that soap build-up & even neutralizes odors. Who knew? I LOVE the smell of this mix. It just smells clean and I love knowing exactly what's in our soap now. I even used it on my cloth diapers today & it worked great! Watch out shampoo & dish detergent...you guys are next! BTW- don't forget to add toilet bowl cleaner to that list! baking soda and vinegar do a great job without that harsh chemical smell! Great Job! You know how I feel about laundry detergent companies... its all a scam! Especially with the amount they trick you into using. Loads get cleaner with less! So, my only question is, is it possible to get a yummy 'tide' smell with a homemade detergent? I just finished the baby's clothes & diapers & they basically don't smell like anything, which I take as a good sign since they're not covered in that chemical fragrance. I'm going to get some lavender oil & try putting that in the dryer to give them a good scent. But vinegar works GREAT at making the clothes soft...his diapers have NEVER looked or felt better. i've always wanted to try making my own detergent but always seemed overwhelmed by all the different ways to go about it! thanks for sharing, now i can just go with your recipe! Thanks for linking to my blog! I'm so glad my post was helpful to you! If you're like me, switching back to the store-bought stuff is just out of the question. that sounds amazing! I cant wait to try it, thanks for the recipe and the links.